Hello gang, Jerm here! I recently had the chance to have dinner over at Shula&apos;s Steakhouse over at the famed InterContinental Hotel. For those of you who didn&apos;t know, Shula&apos;s is located in the beautiful Westshore District of our fair city and themed after the 1972 Miami Dolphins&apos; "Perfect Season and NFL Hall of Fame head coach Don Shula. With a reputation liek that to uphold, you can only imagine that a dining experience here is absolute perfection. Having said that though, for as long as I have lived in the Tampa Bay area, I have never eaten there, so I was pretty pumped to have the chance to go and see what all the fuss was about. I did however need to find a date, asI didn&apos;t want to go and have this great dining experience all by myself, so I called up to one of the prettiest gals I know and asked her if she would care to join me. Shula&apos;s is a very popular restaurant here in Tampa, so in order to make sure we could get seated, I made a reservation using Open Table, which is a very convenient feature that Shula&apos;s also has. Once we got to the restaurant we were shown straight to our seat and that is when the royal treatment began! Our servers Mario and Chris, that evening were awesome. I have been to plenty of places before and dined, but I have never received the level of attention and detail as I did at Shula&apos;s. I am very much a stickler about always needing my glass always full with whatever it is that I may be drinking that night (yes I know I am picky), but thanks to Chris, I can&apos;t remember a time during the evening when my glass wasn&apos;t full and our every need wasn&apos;t attended to. My unnamed Plant City beauty was well taken care as well as they kept her wine glass the entire evening. I wasn&apos;t sure what to expect as far as appetizers go so I asked Mario to make a recommendation and he suggested the BBQ Shrimp. Believe me when I tell you that you have never tasted anything so delicious. 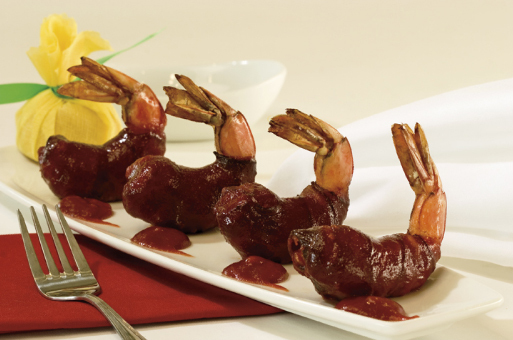 Shrimp wrapped in apple wood bacon with a tangy BBQ sauce, that was so good it makes you wanna slap someone! They could have just brought me an entire plate of that and I would have been good to go! As far as diner was concerned, you can probably guess that Jerm is a steak man, so it was just a matter of which one I was going to choose. Being the gentleman I am though I let my companion order first, and she was in the mood for a little surf and turf in the form of the lobster tails and the fabulous 8 oz filet mignon with creamed spinach as her side. I was almost tempted to be adventurous and try the 48 oz porterhouse, but even I am not man enough to take that task on, although I was tempted! In the end though I decided to go with the 20 oz "Kansas City Strip" as I was thinking I could handle that. As for my side item, I was in a potato mood, so I went with the double baked potato. A few minutes and some good conversation later, I had a feast in front of me, as the portions at Shula&apos;s are rather large. At this point, considering we hadn&apos;t even had dessert yet, I was fairly confident that the Shula&apos;s staff would have to roll us out of there in on a gurney as we were going to be too full to walk! Everything was made to perfection and I was so full afterwards that I could barely move, but I couldn’t stop just yet, not with dessert on the horizon. Since it takes a bit to bake, we actually ordered dessert before we got our meal and decided to go with the Molten Lava Chocolate cake. Yes it was just as good as it sounds. So much chocolate, so little time, and they even give you a bit of ice cream and whip cream on the side. At the end of the day gang, dinner at Shula&apos;s isn’t just dinner; it’s an experience on so many levels. From teh moment you are seated, to the moment when you have to unbuckle your belt to make room, you are treated like royalty. Chef Jonathon Luft and his crew will always be in Jerm&apos;s good graces, and they can rest assured that I will be back one day to try out that 40+oz porterhouse! Great atmosphere, great service, and great food are hard to find all in one, but from Jerm&apos;s point of view this place is top choice. Thats all for now folks, keep checking back for more things to do in Tampa Bay and Tampa Bay nightlife tidbits from Jerm and Christina!